I got into racing along time ago. It was something new to help me stay in shape. One of my memorable races was in Mill City, Oregon. I was riding a Pacific bike that weighed about 40 pounds and I beat a guy on a GT with all the fancy GT kit. After the race he came over with his wife and asked if I was the guy that beat him on my “Toys R Us” bike. I told him yes, and his wife started to say “see its not the bike” and I smiled big! Since then I’ve won a lot of races and even been the “top dog in the state” and also placed second a couple times. These days there seems to always be somebody faster but I finish on the podium most of the time. 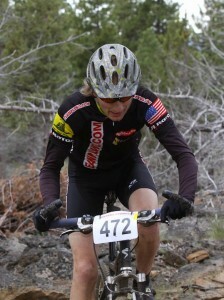 I have met a lot of fantastic people, made many new friends and had a lot of good times with mountain biking. It looks like I need a lot more training… watch out next year ’cause you dont want a 49 year old to beat you! Thanks to Dave, Ryan, and Evan for everything and keeping me inspired–you guys are the greatest!